This is a great drill for working on jump stops, pivoting, and passing. 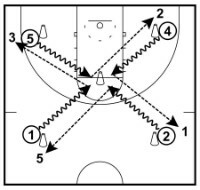 It will allow the coach to teach the different kinds of pivots and is a drill the players enjoy doing. The coach must first create a large square in the half-court by placing four cones an even distance apart. There must also be another cone or D-man in the exact middle of the square. You can see where I recommend placing these cones in the diagram. Split your team up into four groups and send each group to a cone. The cones will be the starting position for each line. The person at the front of each line has a basketball. The first thing the coach must do is tell the players which way they’ll be passing (either right or left) and which kind of pivot they should use. When the coach calls out ‘go’, each player with a basketball dribbles in towards the middle cone, performs a jump stop a couple of feet away, pivots, and then passes to the next line before joining the end of it. The next player in the that catches the basketball does not start until the coach has called out ‘go’ again. Each player must be pivoting the same direction so that two balls don’t end up being passed to one line. Do make sure to reverse the direction half way through the drill. Use front and reverse pivots and make sure players aren’t traveling. Explain to the players it’s better to jump stop with a small hop. The higher they jump, the more off-balance they’ll be when they land.